Fallout 76 patch 7.5 is out today, and it’s one of the most significant in the game’s history. 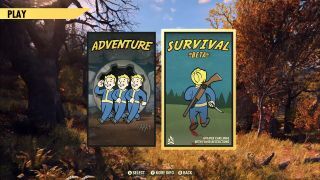 The normal Fallout 76 game mode is now called Adventure Mode and sits alongside the new Survival Mode. Survival Mode is currently in beta, but the gist of the mode is already plain to see: high-stakes PvP with little to no restrictions. If you attack another player in Survival Mode, you’ll deal full damage to them from the start. The “slap damage” system present in Adventure Mode, which would protect your target from damage until they return fire, is disabled. Damage is somewhat normalized to prevent high-level players from steamrolling noobs, and to reduce one-shot kills, but the fact remains that in Survival Mode you can attack anyone at any time and deal normal damage. If you kill someone in Survival Mode, you’ll receive a “random amount” of aid items from their inventory and all of their junk. Cap rewards for killing other players are also doubled, meaning you’ll lose double Caps when you die. If you are killed, you won’t be able to directly seek revenge like you can in Adventure Mode, but you can spend more Caps (at least 200) to put a bounty on your killer which marks them on the map. Which reminds me: players will not appear on the map unless they have a bounty on them or they’re in the top three on the “Longest Life” scoreboard. Other scoreboards include Player Kills, XP Gained, Enemies Killed, and Time Wanted. Survival Mode is unabashedly cutthroat, but it will reward you for braving its lawless frontier. All experience gains are increased by 20% for starters, and accomplished player killers stand to make a lot of money in Caps and supplies. If you’re planning to give the mode a try, think carefully about whether you want to make a new character for it. As Bethesda previously warned, “all your progress from Adventure mode will travel with you, and anything that affects your character in one game mode will also affect them in the other,” and that includes death penalties. Not interested in PvP or Survival Mode? Well, Adventure Mode hasn’t changed. It’s still the same old Fallout 76. In fact, PvP is now even less of a factor in Adventure Mode. Previously, when rogue players attacked you in Adventure Mode, you’d take slap damage even if you didn’t return fire. As of update 7.5, slap damage has been reduced to zero, so as long as you don’t shoot back, you shouldn’t have to worry about player killers or griefers – at least out in the world. Fights over workshops will still feature full damage. Here are some Fallout 76 single player tips for all the lone wolves out there.